Just earlier this week, some friends and I had lunch at Tingkat PeraMakan, which newly opened shortly after Chinese New Year. Despite being the newest kid on the block, the folks who helm the establishment are by no means new to our local F&B scene. 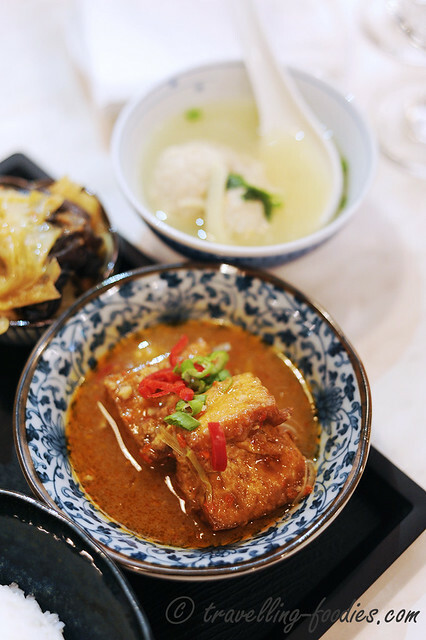 It is part of PeraMakan, a family restaurant serving nyonya cuisine which first opened in Joo Chiat before moving to Keppel Club, Telok Blangah where its main restaurant is now situated. 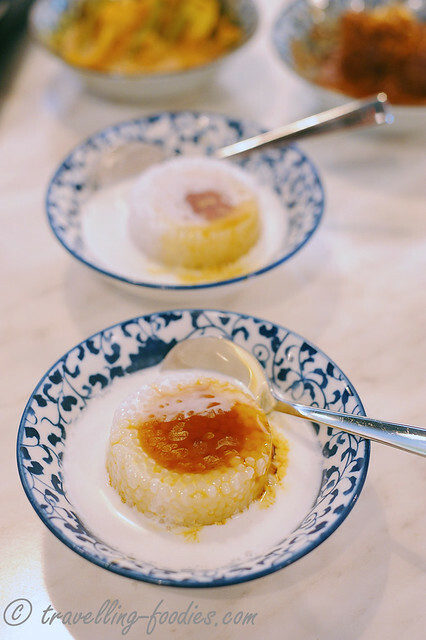 A couple of years ago, PeraMakan returned to the enclave of Peranakan culture here in Singapore, Katong and opened a branch as the main F&B arm of Santa Grand Hotel East Coast. The business venture proved futile and closed shortly after while its subsidiary confectionery which took over Polar Puffs & Cakes next to Boon Tong Kee Chicken Rice and brought Pang Susie back to Katong followed suit and closed a couple of months later. 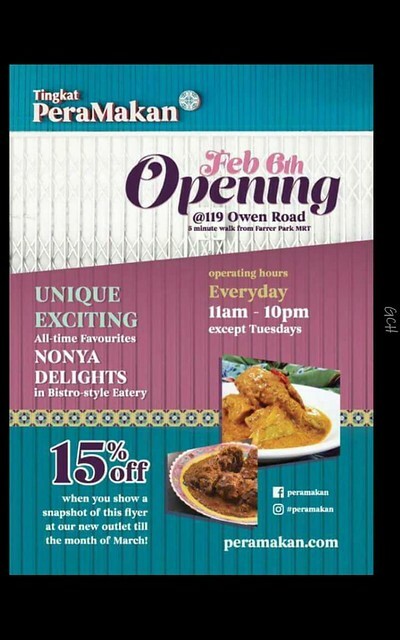 Apart from this new bistro which opened just two weeks earlier at Owen Road, PeraMakan also has a deli located at the basement of Tangs Orchard. 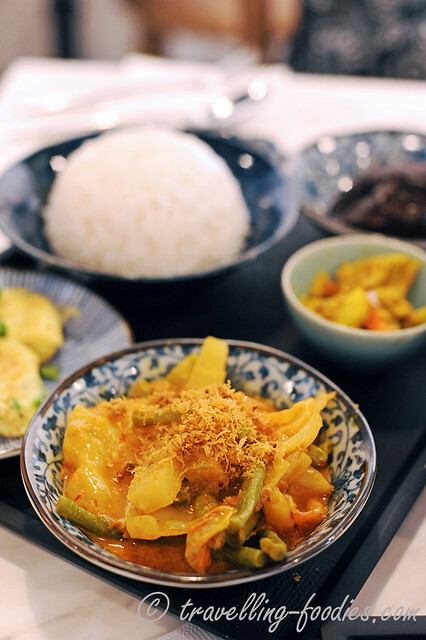 What attracted me to this new deli is the availability of set meals which include a main dish along with 2 sides, as well as achar, steamed rice, a drink and a simple dessert to polish it off. This uncannily coincided with a suggestion I made to Charlie’s Peranakan food, another relatively new nyonya food stall which opened a couple of months earlier at Golden Mile Food Centre. The offering of set meals would definitely appeal more to individuals, mainly the executive office crowd nearby who may dine in small groups or perhaps even on their own, and thus would find great difficulty finishing off whole portions of hearty dishes by themselves. We started with soups which are not part of their set menu but from their main menu instead. Bakwan Kepiting came with two meatballs in each serving where slivers of crab meat are noticeable. 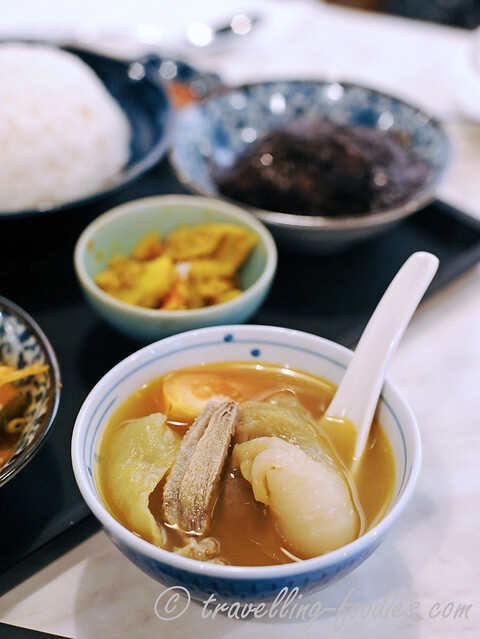 While one could find the familiar strips of bamboo shoot as well as bits of fried garlic which lend an assertive flavour to the soup, the taste wasn’t exactly what I had in mind for this popular Peranakan broth dish. One could make out the umami flavours alright but it was not teased from the seafood which would have provided a more complex flavour profile not to mention a more gradual and natural smoothness to it. Instead, the “sweetness” attempted to create was jarring and somewhat artificial and yes you’d got it right, MSG. But at S$3 a pop, it would sound rather harsh and unforgiving to criticise, or wouldn’t it? Despite being the first customers at the bistro for the day, they only had 3 servings of Bakwan Kepiting available. Kinda off we thought, so some of us ordered itek tim instead. on hindsight upon tasting the meatball soup after it was served, the shortfall of servings was a blessing in disguise. Itek Tim came generously embellished with chunks of salted mustard greens, and duck breast as well as a quarter of fresh tomato. I had a sip of the soup and while it was flavourful, it wasnt as complex as what I had imagined. I liked the presence of pig trotters in the soup base but the duck wasn’t as prominent despite their physical presence. The chopped pieces of duck breast were dry and fibrous from the prolonged boiling and not quite palatable. I would have preferred the tomato to have been cooked down a little before serving though. 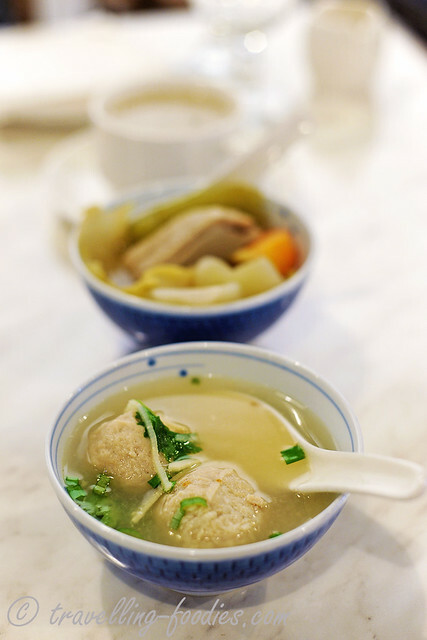 The soup could do with a bit more sourness from asam gelugor and perhaps a hint of spice from pepper as well. The brandy is missing too but yes that would be asking for too much. Again at $S3 a bowl, it would be sound seemingly preposterous to fault. We ordered 3 different mains amongst the 5 of us, i.e. rendang daging, ayam buah keluak and ikan garam asam. I had the ikan garam asam (gerang asam) set, as in the first photo of the post. The gravy was quite flavourful though I would have liked it more spicy. The serving of brinjal and okra was rather generous though. The fish of choice was ikan tenggiri, the smaller, slimmer, cheaper but sweeter cousin of ikan batang. While the fish was reasonably fresh, there was also a lingering taste of bitterness which one could not ignore in the small slab as it was from where the stomach of the fish was and it was quite evident that the fish was not “persiang” cleanly. That was rather unfortunate for otherwise the main would have been more satisfactory. 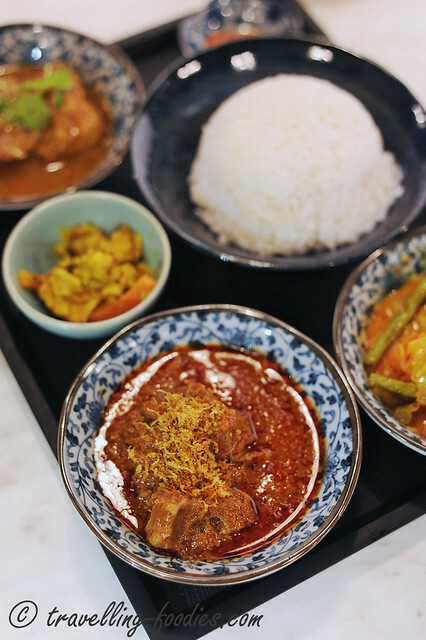 Two other friends had rendang daging, not classicially a Peranakan dish and more Indonesian instead but enjoyed thoroughly by the Peranakans nonetheless. The meat was a tad softer than versions I’ve had at Malay eateries and kudos to PeraMakan for that but I would have liked the nutty flavours from kerisik to be more prominent. That for me is one of the determining factors of a good rendang. Also, there was a very assertive take on the spiciness from halia in the flavour composition of the thick sauce. That seemed a bit odd to me. But overall a rather good rendition. Apart from achar and steamed rice which was staple across all our sets, we could all choose 2 sides amidst the 4 options available, i.e. 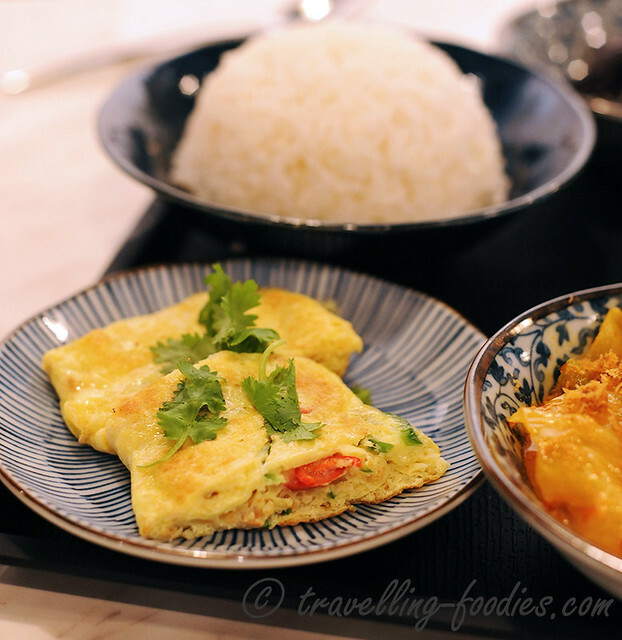 chinchalok omelette, nyonya chap chye, nyonya tauhu and sayur masak lemak. Chinchalok omelette appealed to some of my friends who thought it would be a good option over the others as the omelette would invariably be freshly panfried. Panfried upon order it was, piping hot when served but that was probably the only edge it had over the other side dishes. The omelette was severely “underflavoured” as the fermented udang gerago was totally indiscernible which was kinda disappointing. Truth be told, the nyonya tauhu was ordered with a tint of skepticism as there isn’t such a dish in classic Peranakan cooking. It turned out to be pieces of firm bean curd which had been deep fried first before being stewed in a thick sauce that bears resemblance to that of pongteh, owing to the liberal use of taucheo and soya sauce. It was quite yummy actually, a good contrast against the other spicy dishes. Sayor masak lemak and chap chye were decent options too though the former has an unfamiliar floral aroma which we couldn’t really make out. Jasmine comes to my mind immediately when I had my first taste of it. The vegetables could have been cooked down to be a tad softer. Dessert was sagu gula melaka, very hard to fault. The bijik sagu were nice and chewy while the gula melaka syrup provided a sweet richness to end the meal. The coconut cream was unmistakably “Kara” though and could do with a bit more salt. 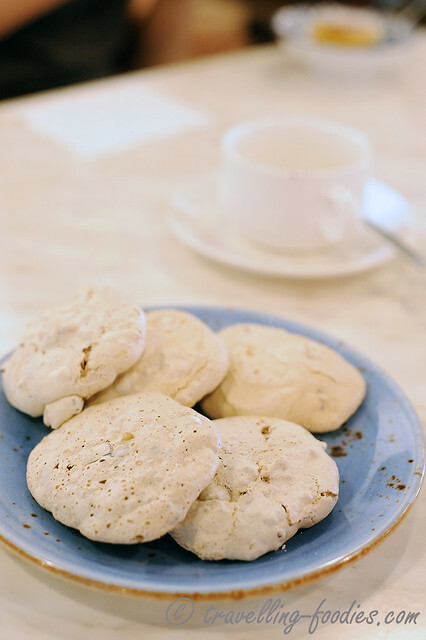 Compliments from the house, meringue cookies with chocolate chips and chopped walnuts. A eclectic juxtaposition to an otherwise classic meal of traditional dishes I thought but we kinda enjoyed these cookies as well. 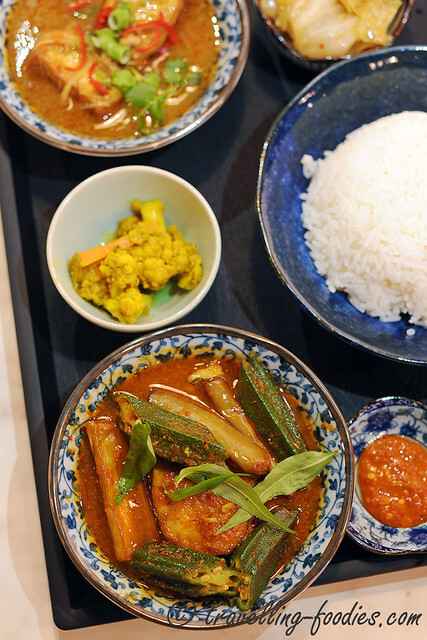 Overall, we felt that while the dishes were decent , they lack in richness and oomph of what one would expect from Peranakan cuisine somewhat. As what one of my friends noted, give everything a 25% discount on your tastebuds and in your mind to what you would have hoped to taste and experience. 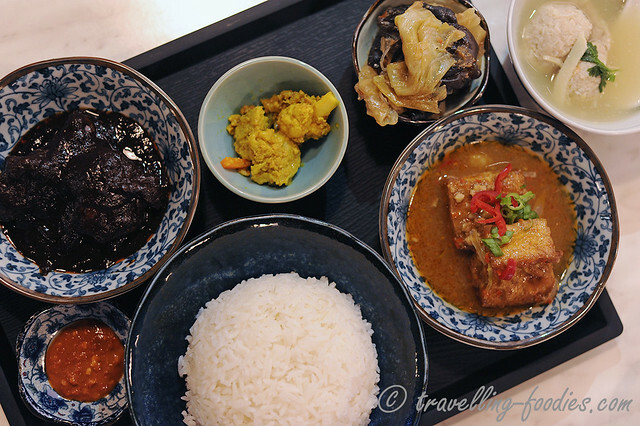 That said, I felt the set meals were quite good value for money, ranging from 14 to 15 dollars per set from those we’d tried, given how “complete” the meals were from the achar appetiser to the sagu gula melaka dessert. There are also cheaper options with ayam klio, ayam sioh or babi pongteh as mains going for only 10 dollars each, before prevailing surcharges and taxes. These set meals were initially intended only as of their “introductory” for their soft opening but from what I was told, their availability have been extended and may eventually become part of the permanent menu. Speaking of discounts, the bistro is offering a 15% off when you show the snapshot of the flyer above at the new bistro upon ordering until the month of March. So what better opportunity than to visit now to try out their sets. Slamat Makan at Tingkat PeraMakan! 11 am – 10 pm everyday, closed on Tuesdays. This entry was posted on February 23, 2017 by Alan (travellingfoodies). It was filed under General .